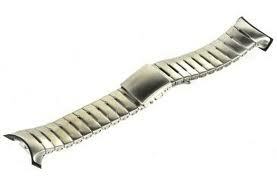 Suunto D6 Replacement Metal Watch Band is solid in more ways than one. Custom-designed for your Suunto d6 Dive Watch, t he Suunto D6 Watch Metallic Bracelet holds your Suunto Watch securely on your wrist, whether on land or under water. Whether you need to replace a worn watch band, or just want to have another option for look, style and function, the Suunto D6 Metallic Bracelet will perform flawlessly. Your dive computer will look stylish enough to be worn every day with this slick new metal wristwatch band.